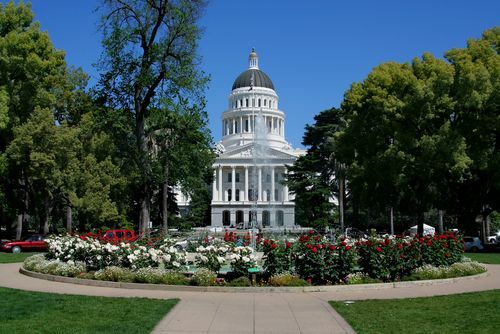 This 5.24 mile loop runs around the perimeter of the Sacramento State Capitol building, or “Capitol Park.” Known as a Sacramento staple, the Capitol serves as the finishing point for The California International Marathon, Sacramento’s premier marathon. The central area is often filled with runners before work, during the weekdays. Circling the gardens which line the paved sidewalk, this route not only runs around the entire Capitol Park, but also by the Capital Mall, Sutter’s Fort State Historic Park, and the State Indian Museum. The Capitol Mall, or Capitol Mall Blvd, is a major street and landscaped parkway, that connects downtown Sacramento with the city of West Sacramento in Yolo County. The mall runs Westward through downtown, over the Golden State Highway, past the Riverfront Promenade Park, and across the Sacramento River on the iconic Tower Bridge. Many of Sacramento’s major businesses are located on the Capital Mall. This route is centrally located and offers a beautiful view the whole way. There’s also free parking available by the 13th Street parking lot.